Hello again! 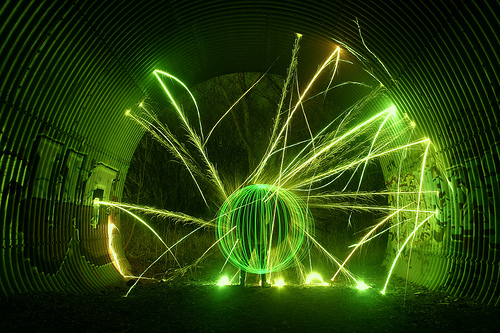 It’s Dana, twin cities brightest, back again with more tricks for light painting photography. I hope you have all been practicing because it’s time to deal with the unruly beast – fireworks. So, fireworks, as the name suggests involve fire. And fire is dangerous. In fact, as the saying goes, you should not even try this at home. Since I know quite a few will I am including some basic safety rules at the end of the post [read it and come back]. It would be best, however, to coordinate this with your local fire department. Now that we all agree to be safe we can get down to business. Fireworks for the most part are really bright. This means that a lot of light will be coming your way and you need to adjust your settings accordingly. With small led lights we used an aperture of F/3.5. To keep your picture from burning with the intensity of the firework’s light you will using smaller apertures (somewhere between f/6.3 to f/8.0). This means that you may have to expose a bit more after you are done with the fireworking to allow for proper background exposure. Take a reading of the ambient when you are set to aperture priority before you start to get an idea of the proper exposure. 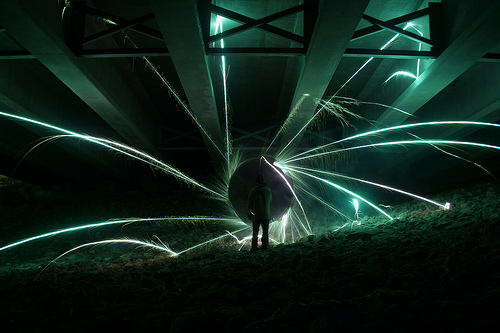 A different aspect of shooting outside is light contamination. If your environment is not light sterile, you may have to deal with moon light or other light pollution. If that is the case, you will want minimize your exposure time. It may come as a surprise but the moon is really bright and will burn after about 2 seconds of exposure. If you are alone (which you should not be) you can set the camera on bulb and block the lens with our back until you set up. if you are shooting with a friend, don’t start the exposure until you are setup. Lastly, you can stack two images together in photoshop. One with the fireworks properly exposed and one with the environment properly exposed. Sparklers are super fun, and even better on a sting. Actually, Almost everything it do I have the firework on a string. It’s farther away from the hand, and you can get more fluid movements out of it. Generally, the same principles as creating orbs apply here too. There are two options to light the sparkle. You can light it outside of the frame and walk into position – this will create a tail as in the picture below. 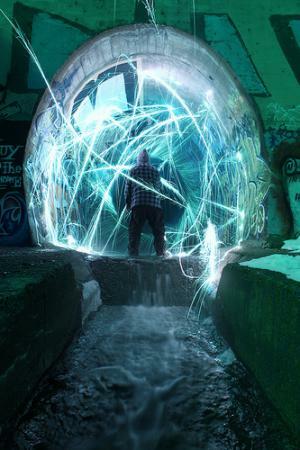 Or, you can set your camera to bulb and light the sparkle with your back to the camera, this way you will have “clean” orb image with no trail. There is another sneakier way to avoid the tail especially if you are shooting alone. Set the camera to continuous shooting, say about 20 seconds at f/5.6 or f/8.0. Press the shutter and do your business. 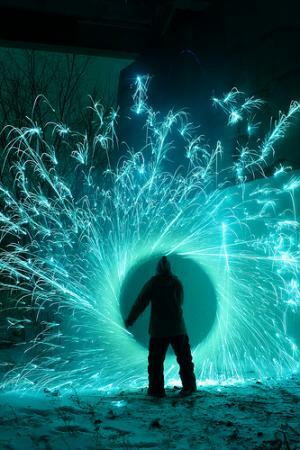 The first shot will be a throw away image – it will cover getting into position and lighting the sparkler. 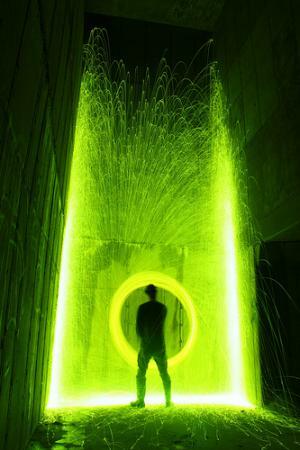 Once it’s lit wait for about 15 seconds and start the orb going. Rotate around until the sparkler goes out. If you bought the long burning kind you should have made about 5 rotations in 45 seconds of turning. The first photo should be a throw away, getting ready and lighting it. 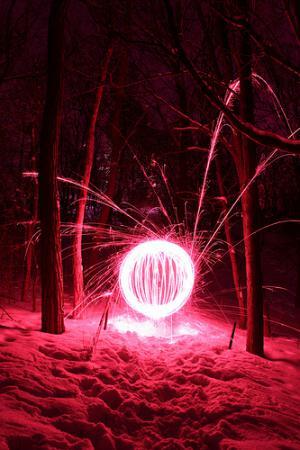 The second or third however should be just spinning the sparkler and making an orb. Roman Candles are unpredictable to say the least. There is a good chance that you’ll need a huge bunch of them to practice and get your rhythm going. For practice sake and some cool smaller scale shots you can use mini roman candles. I found a couple of different kinds, but they don’t have reports. Reports are the loud booms sometimes heard in fireworks. 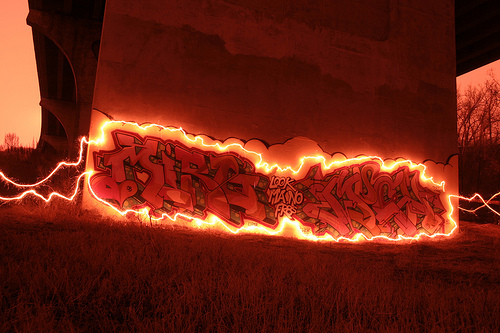 For light painting you don’t need noise, and I usually don’t want to be heard or seen at any case. 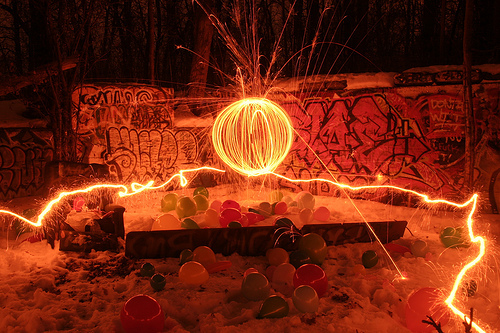 So roman candles are ideal for light painting as they are predictable in the way they sparkle. Other larger roman candles are good too, they shoot farther and sometimes have great effects. The problem is finding the perfect large candle. Most come in a multi pack and only a small fraction will work well. Fountains are meant to be set on the ground and admired from a distance back. But with safety equipment you can attach smaller fountains to a string for spinning too. These fountains tend to sparkle and crackle without too much craziness happening, which is good for photos. 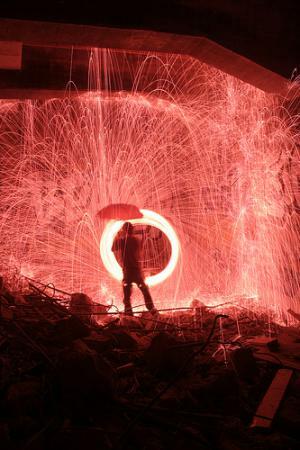 Steel wool grade 0 and finer (00, 000) are flammable. 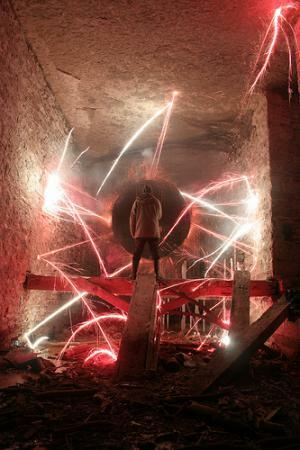 You can attach a pad to a wire or string and spin it around and create a shower of sparks. Here is the trick, it only showers sparks when you spin or move it so some kind of spin works best. The air gets in it and fuels it so the faster you swing the more sparks you get. I use a string and wire combination. I attach a small thread of steel wire to the pad and tie it to the string. This way the wire wont melt and I just twist tie each loaf on. 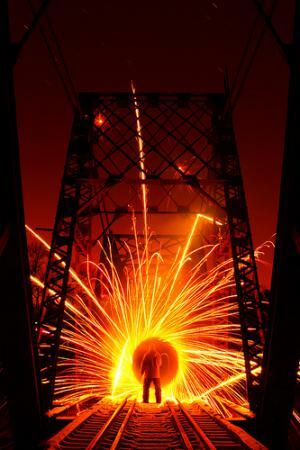 One of the cool things you can try is igniting the steel wool with a 9V battery. When I was a kid we used to press those to out tongues and feel a slight tingle. Really, thinking about this now, I cannot see the thrill of it. Anyway, touching a 9V battery to a fine steel wool will ignite it, just light a match will. Fountain and 3 mini roman candles on a string. It turns out that some of the fireworks are not legal in all countries. Make darn sure that you are not violating any laws when you practice this art. Sparkles are legal in most places but for some of the heavier stuff you need to have special license. As I said earlier, the best thing to do here is to call your local fire dep. explain what you are going to do and get them all exited and let them be of the fun. Heck, they can play the models on your pictures. 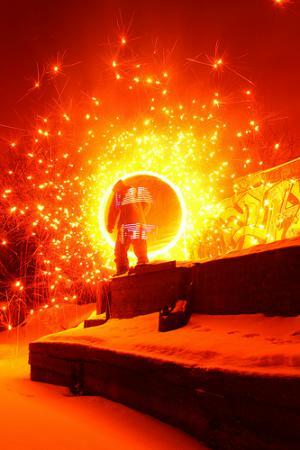 How cool would a fireman inside of a sparkly orb be? Very cool! They will also know to direct you to places where you can practice this art safety. First of all make sure that you are safe. Wear long sleeved shirt and pants from non flammable material like wool. It is better to sweat a bit that to burst into flames. Protect your head – Wear a wide hat. If you have long hair, braid it and stick it in the hat. Use some eye safety – welding goggles or heavy duty sky goggles. You also need to make sure that you do not start a fire. Avoid forests and dry fields. You can get into serious trouble so be smart. Concrete yards will work best in terms of safety. Have an extinguisher close by. You will probably not use it. But you really don’t want to be in the place where you wish you have brought it along. Lastly, and I cannot stress this one enough – Dont.Go.Alone. In case anything does happen a team of two will work faster and more efficiently that a solo person. « Are Cellphone Cameras Good Enough For Today’s Screens?